Our Public Trello Board: Vote For Your Features! QuickAdminPanel reached the phase when there are more customer requests and our own ideas than we actually have time/people on the team. So we need to prioritize a lot, and for that we’ve updated our public Trello board, so that our customers will see our nearest plans. Priorities are ordered from top to bottom, meaning we’re doing top cards first and then go down the list. Also we have an internal Trello board with three times as many cards – our own ideas, small core improvements, bug fixes, marketing stuff. We will try to update the public board, too. Now, help us to help you – if you have a feature request or a comment on existing Trello task, just click on any card on the board and add it there! Or, alternatively, add a comment to this article, and we will transform it into a Trello task on the board. For those who haven’t used Trello – it’s a simple drag-drop task management system where you can add/edit/comment tasks, drag them from column to column until they reach “Done” stage (or whatever you call that column). Totally recommend it, easy to use! 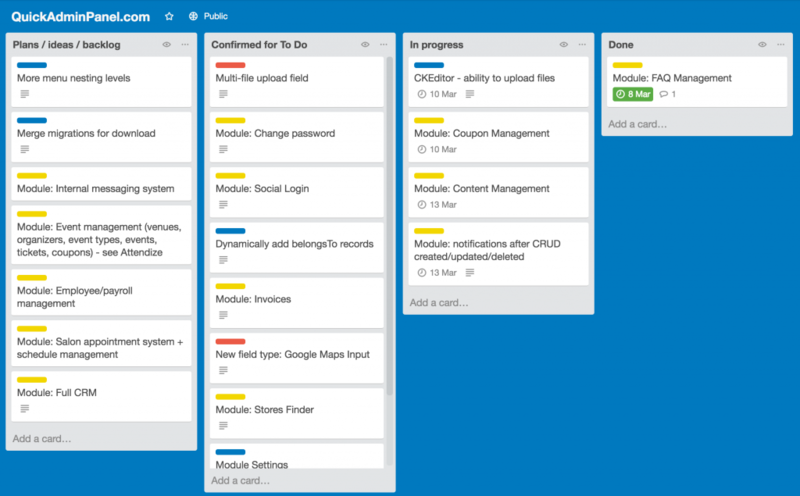 Not sure if Trello has a voting feature to enable – could you explain how to do it? I like this! I just entered a handful of votes. Thank you Povilas and the Laravel Daily Team! Yes, we removed this board cause it didn’t pay off, priorities were constantly changing according to users feedback so was hard to keep it up to date, felt like we were over-promising and under-delivering for some customers.